With a low-profile design you won’t even notice you are wearing Dakine’s USCG Approved Type V Inflatable life jacket! Designed to be worn around your waist, this life jacket provides maximum comfort and maneuverability while paddling for a day of unhindered fun on the water. 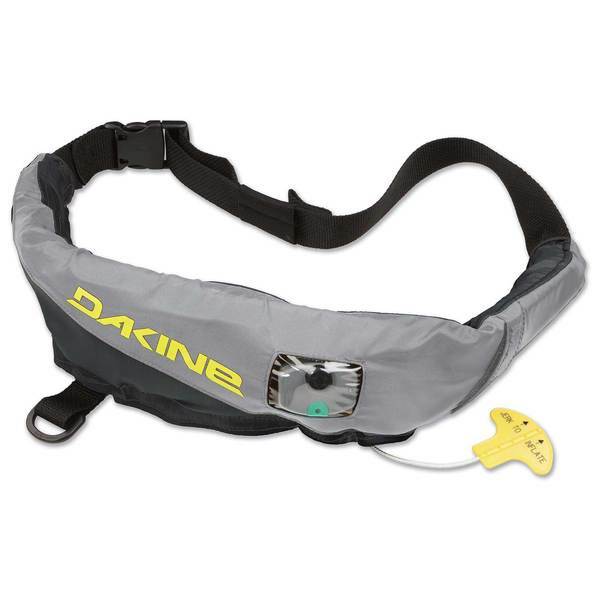 Dakine constructed this PFD with an easy-to-use manual pull-cord to inflate the life jacket and oral inflation tube for backup. Buoyancy is provided with a 16 gram CO2 cartridge and a storage pocket keeps your keys or other essentials close at hand. When not in use, the lightweight, compact design easily repacks for stowing away. This type of life jacket must be manually placed around the head after inflation and is therefore recommended for competent swimmers only. Storage pocket to store your keys, snacks, etc.